We are honored to premiere the book trailer of one of our favorite authors, Josh Funk. 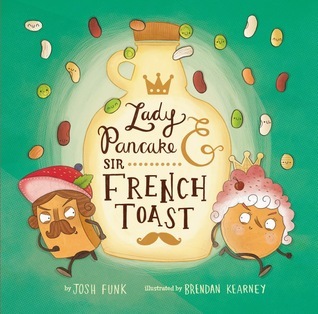 Josh has made a huge mark in the field of children’s literature, and we are thrilled to share the book trailer for his third book in the Lady Pancake and Sir French Toast series (below). 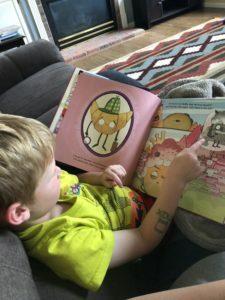 Not only is Josh a favorite of parents and teachers, he is a favorite of kids! Our sons are so, so excited for the new book in the series. As teacher moms, we thought it would be fun to build their anticipation and help them learn about making predictions. We invite you to have this same fun with your own children or students! We asked Trent to review Lady Pancake and Sir French Toast (Book #1). Warning: Trent’s review has a bit of a spoiler in it!!! 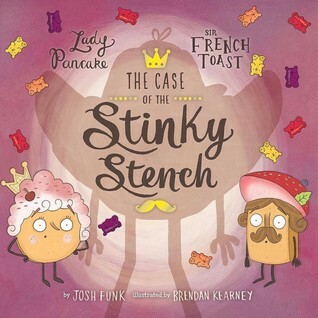 Trent’s Review: Lady Pancake and Sir French Toast were fighting. They both wanted syrup. The adventure through the refrigerator was silly. I liked the broccoli forest and jumping over the strawberry. But the awful waffle is the bad guy. Baron von Waffle makes me grumpy because I wouldn’t like if someone ate all of my food. I do like that they [Lady Pancake and Sir French Toast] didn’t fight eventually. And the rhymes were silly willy! 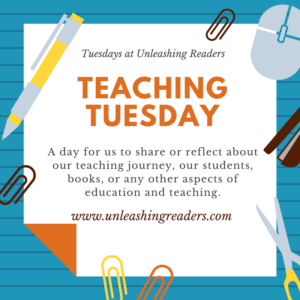 Kellee’s and Ricki’s Review with teachers’ tools, discussion questions, etc. can be found here. We asked Henry to review The Case of the Stinky Stench (Book #2). 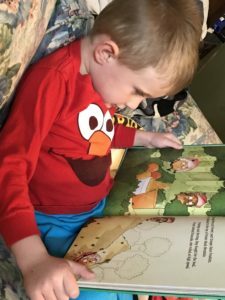 Warning: Henry’s review has a bit of a spoiler in it!!! 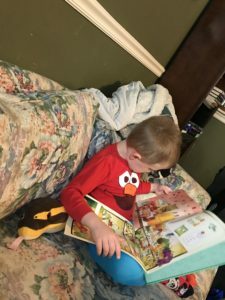 Henry’s Review: I think that there were things in the book that were stinky! At the beginning of the book I thought Croissant was making the smell. The fruitcake was stinky and rotten and sad. I think Baron von Waffle got him that way. I like when the fruit cake stands next to cheese. “Type that, Mommy. It’s important.” The book is very good. I like Lady Pancake and Sir French Toast. I really like the gummy bears on the cover because I am really hungry for one right now. The story is so good. I would give it to a friend to read, but I want to keep it for myself. It’s my book that I like to read a lot. Ricki’s and Kellee’s Review with teachers’ tools, discussion questions, etc. can be found here. Then to get the boys excited about the next book, we decided to have them take part in a prediction activity! Trent’s prediction: Sir French Toast is going to get frosting. But I don’t know who is the bad guy. Henry’s prediction: I think Sir French Toast is going to get defrostable. I don’t know what will happen with Lady Pancake. Can I see the cover now? Henry’s prediction: Somebody is going to drop into the big container! Lady Pancake and Sir French Toast are going to…maybe they will eat some of the ice cream. I hope they don’t get hurt. I want to have this book. Can we get it, Mom? Trent’s prediction: Lady Pancake and Sir French Toast are running from the bad guy. I don’t think the popsicles are the bad guys because they are dancing with their friend, ice cream. Maybe the waffle is the bad guy again. Trent’s prediction: Yes. They’re frozen food. Because the refrigerator is really cold, and waffle won’t help because he is a bad guy. The popsicles are dancing because it is cold. Henry’s prediction: They are going to be frozen food! I think Agent Asparagus is going to become a bad guy and get Lady Pancake and Sir French Toast and catch them and shoot a web over them with sticky slime to get them caught! 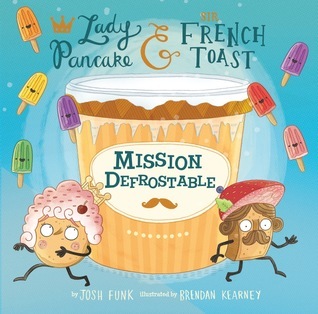 Henry’s prediction: I think the popsicles on the cover are going to come into the book more and Lady Pancake and Sir French Toast are going to lick them and get their tongues stuck. Baron von Waffle…I don’t know what is going to happen to him. But I think it is bad. I don’t know any guesses about what might happen to him though. We will see in the book when we get it. It’s going to be fun to get to read it. After this one, is there going to be another one coming out? I think there should be, and it should be called Mission Accomplished. Trent’s prediction: Baron von Waffle is going to ruin the world because his friends, the popsicles, want the refrigerator cold. The bananas look bad also. Maybe the big bad person are in the castle! Maybe the popsicles aren’t dancing, they are laughing and that is why Lady Pancake and Sir French Toast are running because the popsicles are bad. I’m excited to see about the popsicles–I want the book! 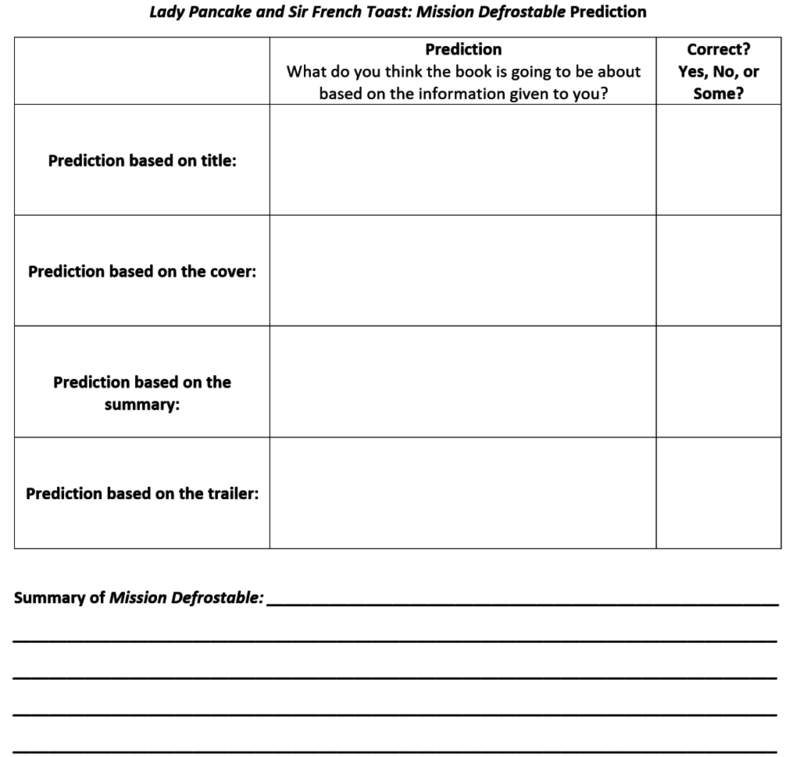 The boys’ summary (the last part of the prediction activity) and review will be shared when we review the final title! 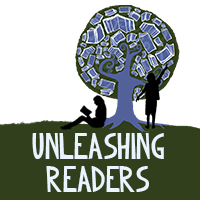 We are so excited to be able to premiere this book trailer with the world! Thank you, Josh, for the incredible work that you do. You are a gift to the literary world. 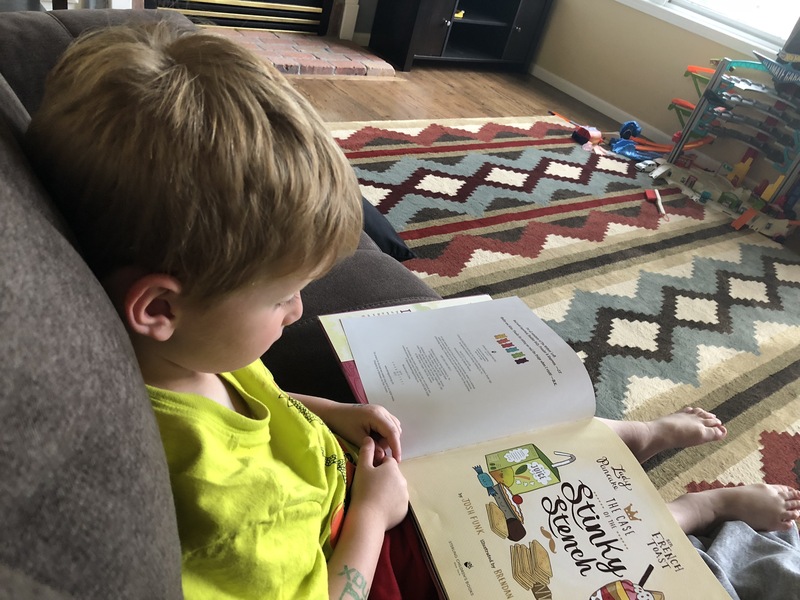 And we cannot wait to share our (and the boys’) thoughts about the newest title! Thank you so much for hosting, Kellee & Ricki & Henry & Trent! I am amazed at your insight – some of your predictions are SPOT ON! Thank you so much for hosting the book trailer premiere! I loved this post! This kids’ predictions were fabulous and the trailer makes it obvious that Josh has another winner on his hands! Thanks for sharing! Great fun to hear what Trent & Henry thought all through the different layers. 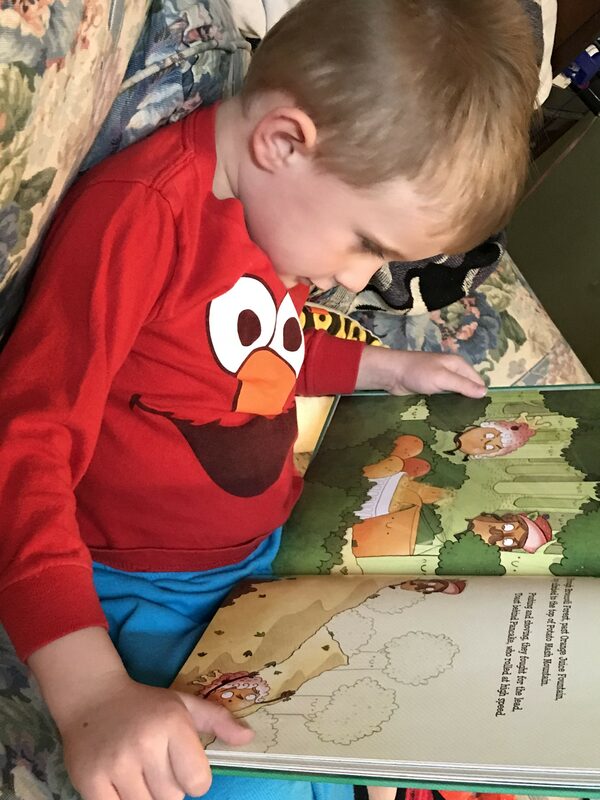 I know the book will be a favorite of my granddaughters, too! Thanks, Kellee & Ricki, & Josh!